Chevrolet has cooked up several videos that aim to take the thirteenth generation, aluminum-bodied Ford F-150 head on. But this isn’t the usual, “We can tow more and are better because X, Y and Z”, poking and prodding that the pickup truck segment is so well-known for. Instead, Chevrolet continues its anti-aluminum campaign to make truck buyers question Ford’s strategy of using aluminum in the body of its new full-size truck. This particular Head-to-Head spot aims to differentiate the steel Silverado and aluminum F-150 by presenting the increased time and cost to repair the F-150. In traditional Chevy Truck fashion, the spot is presented by Howie Long, who discusses the Silverado and the F-150 with Chevrolet Chief Engineer Eric Stanczak. Right off the bat, the two have the seemingly never-ending aluminum vs. high-strength steel conversation, pointing out that the Silverado uses aluminum in a few “strategic” places, such as the hood. Chevy then presents an independent test from a company, AMCI, to show exactly how much high-strength steel was less costly and quicker to repair than aluminum after the same kind of damage to both trucks. In the end, the F-150, with its aluminum body and structural adhesives, took 34 days longer and cost $1,750 more to repair, on average. “At Chevy, we rely on what’s proven, like high-strength steel for high-strength dependability”, replies Stanczak. “Well I guess that’s why they don’t call that superhero the man of aluminum,” Long comically concludes. 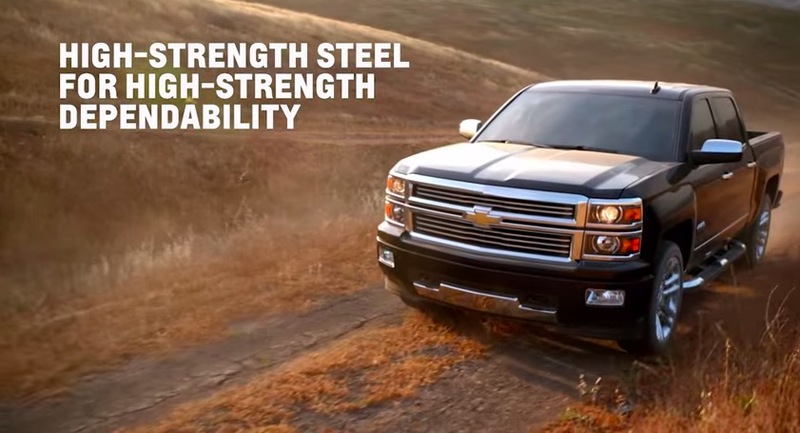 Ironically, Chevy will use aluminum extensively in its next-generation Silverado. What do you think of the video and information presented therein? Talk to us in the comments. Regarding the hand-holding GM Centric message, it fails to list the disadvantages of steel. Higher mileage. Ford isn’t doing this for kicks. They’re doing it increase mileage for the environment. Not that the planet matters. Ford has overhyped its use of aluminum in the F150. The mileage or environmental importance hasn’t increased by much over its previous trucks, or the competition. I could care less, if any of the other manufacturers chose to also use aluminum or not, there’s other factors to look at when choosing a vehicle. Just like the example of GM, and the case from Chrysler, any of these vehicles manufactured from today, from any manufacturer have a possibility of being hacked, even Fords. There’s even a slim possibility to be hacked again after a patch, it’s like any other software security. Just like there are no cars that are 100% safe, there’s no way to really make things 100% secure. The OnStar app as an app, is a web browser, it connects to the sites that GM uses for a particular feature. There are new technologies to make things more secure with Internet transfer, however the government has regulations on how secure something can be. I’m sure GM, and other manufacturers will find ways to improve the security of its vehicles and services as technology advances. A flaw like that doesn’t mean a product or company is bad. Dane — I’m not complaining about the OnStar patch. I’m wondering why this site isn’t addressing it with a story. If this site is to be an ‘authority’ on GM I was rather surprised to find a story I needed YESTERDAY on Autoblog instead. Well Ford can explain it six ways to Sunday and it still comes out the same. #1 Aluminum is more expensive now and will be in the near term. That may change but it will take time. #2 Aluminum is much more expensive to repair and most shops at this point are not equipped to properly deal with the repairs. #3 No more paintless dent repair as aluminum is very difficult to repair a ding with. It has no memory as steel has and make the cheaper and easier method more difficult and in many cases impossible to repair unless you replace the panel. #4 Ford did save over 700 pound over their own truck but the advantage over the present GM truck is 83 pounds in most Crew configuration and varies a little with other models. The truth is Ford just really caught up. They have done a hell of a good job marketing as many people think this these trucks are leading edge though other automakers have used it for years. Check out any old UPS or potato chip truck and they have been aluminum for years and in many cases step vans will be on their third engine due to no rust. The fact is GM and Ford are preform similarly but they just are doing it in different ways. GM with the V8 and Steel Ford with a V6 and aluminum. GM for now is relying on the mid size truck and the full size half ton will see more decrease in weigh with materials and major engineering efforts as they have done in their cars. I find it more impressive they killed off 300 pounds in the Malibu with no major expensive materials. They did it the hard way engineered it out. John I understand you are excited about the hacking here as it may be new to you. A lot of us have expected it was just a matter of time and to be honest like our home computers it will be an on going threat. Generally it will not be wide spread for a good while and hopefully the companies will keep reacting fast. You can’t really plan ahead on these as you never know what you are fighting till hit happens. There really is not much use in tapping any cars now other than to prove a point. But I have seen some feel some cars will be killed and you may get a note to pay $5,000 ransom to get your car to run again. I am sure they will come up with creative things. Also I expect computer companies will come in with ways to protect your car just like your home computer. I expect man will just disable OnStar as most people do not have a subscription anyways. One question I have is can they come in through the XM Sirius Radio to hack. The radios today are connected to the computer. Can they send a command that way? I hate to say it but this is just going to be a way of life for most of us. What worries me are all the smart appliances the government is trying to force on us. They want to monitor our power use but anyone could hack into them too. I think you have more of these applications in California. I remember see much about it when I am in San Diego. I am not ‘excited’ about the hacking. I’m wondering why two major stories regarding this hacking were not covered here. As I just said nearby: if this site is to be an actual ‘authority’ on GM why did I have to learn of this issue on AutoBlog? It was BIG news yesterday and today. The jeep deal got most of the coverage because it was more high profile. The OnStar one was covered by less and really has been a low key story. This site here covers a lot but they don’t cover everything. I think it was just one of those deals. Lets face it too often we get many silly stories like Kyle Bush wins a race in a Toyota or some goofy car on e bay is for sale. I get many stories elswere that are often not covered here. I just chalk it up that this is the web forum and not a real news organization. We will see a lot more on this as time moves on. Nearly any car since a GPS unit was activated in the computer of the car could be affected. I really don’t expect much to come from this but it will pay well in the news. I am willing to bet some protester will shut down cars say on I5 to grid lock the town for a bit to make a point. Etc. Then it will be the lead story. It will be interesting to see how each company reacts. Some will do better than others. 1. The discovery that OnStar could be hacked. Just days after a similar story. 2. GM/Onstar attempted to fix it server side. And failed. 3. GM/Onstar issued a software patch to their apps which it recommends all users install. Those are important stories. Not two pinheads having a slanted fake conversation about how GM steel is cheaper and better than Ford aluminum — a process GM will be bringing to trucks anyhow. Let’s face it, Scott3. GMA refuses to dignify this story because it’s embarrassing to GM and OnStar. Perhaps OnStar pays for ads here. I don’t know and I don’t care. This dancing around an obviously relevant story renders this place as not an authority at all on GM. More a marketing blog. Too bad. If you see less of me, that’s why. The most effective way to communicate these things to us is using our Contact Us page (as compared to leaving a comment). Funny they went back to Howie – I remember him pimping pickup drivers about creature comforts like heated steering wheels and other ‘un-manly’ things that Chevy and GMC now offer. The ‘white-hat’ hacker is presenting his findings this coming week, along with the guys who did Jeep. The encryption is still vulnerable on both makers, according to these guys. Guess it’s fixed now. In the meantime, ‘white hat’ hackers can help the Office of Personnel Mgt, Social Security and the banking industry. For starters. I sent you guys an email, got no response after two hours, and figured it didn’t go through somehow. That’s when I dropped a line in comments. Now I see the TIPS part of the site. I forgot that was there and sent to your webmaster email. They have your story posted now. To be honest I have not seen it on many other sites and not really much on yahoo either. Most are still focused on the Jeep hack. I hated these spots as they are so contrived. But John I would not putt all your money on GM aluminum. Odd are much better they will build the trucks much like they are doing the CT6. It will have a mix of panels that will take advantage of the areas where it best performs and will have greater effect in keep material cost down. repair cost down and profits up. For really took the easy way out just replacing a material. They really should have done more engineering and material changes and they may have taken off another 200-300 pounds. As it is they caught up to where GM is and I expect GM to continue to engineer out the weight. It is harder to do but it also pays off much more in the long run. Ford base prices have remained similar but the option prices high a increase in truck cost. Once you start adding options the price of the truck starts to creep past the Chevy. Also with higher material cost the rebates that they will and have been offering will be more painful. No matter how popular they are truck buyers are trained to buy with rebates. It is kind of a Pavlov effect. They buy when they see the rebates. I always feel it shows a sign of weekeness when you directly go after the compatition publicly. Same with that aluminum man thing they did. Fords marketing team knows what there doing. If GM switches to aluminum for there next truck like this site has covered before, they’ll have just put there foot in there mounth. It just looks like free advertisement for Ford. I believe they need a new tradagy. Long ago, the industry, not just GM, decided to transform the pickup market, into luxury designs. Heated steering wheels are unmanly? So, with that conclusion, what is to be said about males that drive luxury cars with such a feature? Trucks can be used for construction, ever gone outside to do construction in cold conditions? It’s a great option to have. As I stated before, the OnStar issue may or may not be fixed, however Chryslers, and those with OnStar, are not the only cars, able to be hackable. It seems like just because it happens to one company first, everyone that hears about it makes it seem like a fault the company should have known about before release on something new in the industry. It doesn’t necessarily mean a company and it’s products are bad. Hacking is most likely going to be an ongoing problem just like computer viruses for years to come, for any manufacturer. There are some ways to make accessing the cars onboard systems more difficult to access from future hacks, and it’ll only get more interesting to see the different approaches taken, by manufacturers in future products. It’ll probably be by having an extra module or something. GM may go to aluminum frames, to say they’re shooting themselves in the foot, is not completely reasonable. They can go to aluminum, but their trucks are steel, so they make ads like this for marketing, every other competitive business does the same thing. If GM went to aluminum first, Ford commercials may look something like this. Ford engineers definitely know what they’re doing, so do engineers at every other manufacturer. Making your cars lighter is one thing, but they didn’t really do the rest of the job. The gas mileage isn’t really that significant over its previous trucks or the competition. Getting a few MPG, over the previous truck, or the competition, just isn’t something that I would personally see as a consumer, and immediately be sold on it.